This is a cold saw that is used to cut column used as building material, billet, steel pipe, rail, automobile parts, etc. 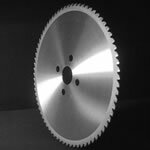 This saw is applicable for cutting machines manufactured by Nezu, Sumitomo Heavy Industries, Ltd., Mitsubishi Heaby Industries, Ltd., Endo Kogyo Co., Ltd., Noritake Co., Ltd., Mitsuya Engineering Co., Ltd., Kaltenbach, Heller, etc. Since 1990, we have accumulated high grinding techniques and know-how through the development of the re-grinding chip saws for metal cutting. We have supplied the milling cutter for major domestic steel makers with consistantly excellent performance and extreme accuracy and rigidity. *Metallic round cutting blade can cut solid round bar and pipe. 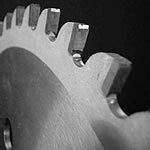 By changing the tooth shapes and thread numbers it is possible to cut a wide range of materials from general steel to stainless steel. Nezu, Noritake, Nishijima, Kaltenbach, Kentai, etc. The throw away type metal cutting blade is can be used for re-grinding.